But I’m not going to write about any of that today. I’m going to share a recipe! Now that I’m the “full-time cook” for myself and my grandmother, I’m trying some new recipes and perfecting some old ones. One in particular that has come in handy for many a dish is this pie crust recipe from a newspaper clipping. It is so easy, and I’ve used it for chicken pot pie, spicy bean beef pie, and even a pizza! I’ve yet to make a dessert pie with it, but that’ll come soon, I assure you. In fact there is a bag of fresh blueberries just waiting to be made into this fabulous sounding Blueberry Cheesecake Ice cream Pie that’s on the cover of the July Southern Living magazine! That makes me wanna drop everything and run to the kitchen! Yep, I just did…only it was to get the pie crust recipe, not actually make it. Sigh. But I did taste the purple hull peas on the stove to see if they were salty enough, and that’s as good as dessert! Alright, now for the recipe. Mix flour, salt and sugar in bowl. Combine oil and milk, and pour all at once over flour mixture. (Or forget and pour individually. It won’t mess up the dough, I promise.) Stir with fork until mixed. Shape into a ball, place on sheet of waxed paper, flatten and cover with another sheet of waxed paper. (For easier handling, chill dough 30 minutes to 1 hour). Roll dough out between the sheets of waxed paper to desired thinness, using a rolling pin. (You can dampen counter with water to steady the wax paper). Peel off top paper carefully, and turn dough upside down over pie pan, then remove second layer of paper. If crust is to be baked before filling, prick all over then bake about 10 minutes at 425. Makes 1 8- or 9-in shell. This can be doubled easily. Now for the pizza, I went ahead and put dough in a pie plate, rather than jelly roll pan, and did a sort of Chicago-style pizza. 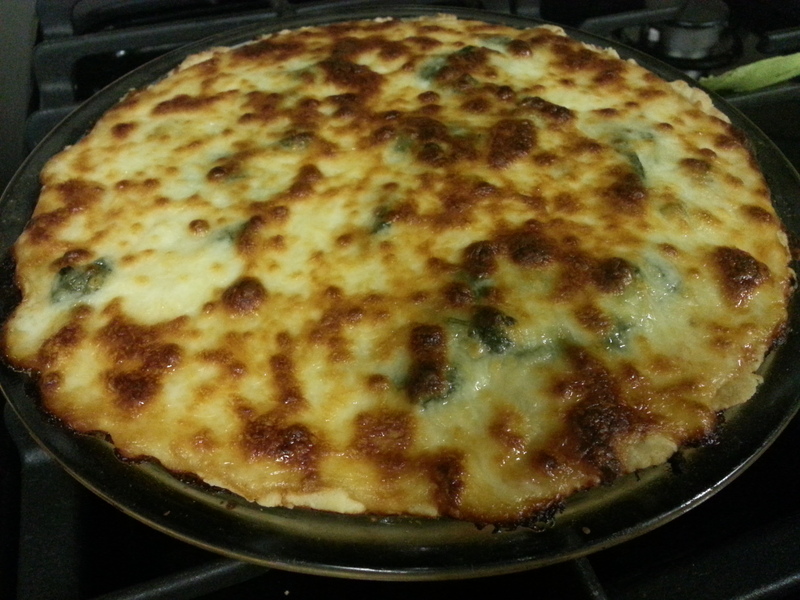 I layered it with sausage, sauce, onions, peppers, cooked spinach, and topped with lots of mozzarella cheese! YUM!